We are now officially mired in the swelter of summer, leaving us languishing for the ocean breezes of the South Pacific. Obviously, something Tiki was in order, which is ironic, since if you want islands with a long tradition of rum drinks, you’re in the wrong ocean. Be that as it may, B found a new entry in the Tiki lexicon. This one is by @Drinkboy, Robert Hess, who created it in 2006. In his own words, “…Polynesian inspired restaurants were intended as a mini-vacation, hence the Voyager name. That, and the fact that I’m also a Star Trek fan.” The curious inclusion of Benedictine in this was enough to get me on board. Shake with ice and strain into an ice filled rocks glass. Garnish with a lime wedge. As you can see I decided to change up the presentation a bit, using a crushed ice filled Tiki mug and a cherry and mint as the garnish. Hey, it’s Tiki; go big or go home, right? Both B & I really liked the Voyager. Despite the amount of Benedictine and falernum, it isn’t cloying, a reservation I had going in. It’s definitely Tiki, but not insipidly so. Give it a go. Great and timely post Michael. 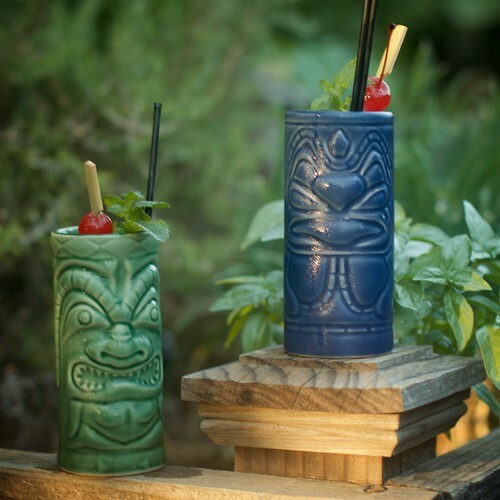 I mostly like the tiki glasses! Don’t know falernum; sweet? According Wikipedia (too lazy to write this myself) “Falernum (pronounced fah-learn-um) is a sweet syrup used in Caribbean and tropical drinks. It contains flavors of almond, ginger and/or cloves, and lime, and sometimes vanilla or allspice. ” You can make it, but I decided to buy it since I don’t use much. Enjoy the rest of your time in Italy.